On Monday, we shared Shiner's new Christmas tree ornament but did not show you a picture of the entire tree. Here it is! Shiner is admiring her work. CLICK HERE for more Wordless Wednesday blog photos. Rightly so as it is fabulous. Have a wonderful Wednesday. Your tree is beautiful Shiner! It's beautiful!!! BTW, I ordered an ornament from them for Luke, and it's on it's way already! Pawsome! They are quite affordable aren't they? Yes, I was impressed! I ended up getting the acrylic one as well, with a sheer red ribbon. Don't you love a nice shiny tree? We certainly do. Yours looks so cool! So pretty. looks like you're ready for the holidays. You've got a lovely tree! Wonderful tree! Shiner does look impressed with her work. Your tree is EXQUISITE! It has an old-fashioned look, which I love! Warm and cozy! Thank you! The tree itself is only in its second year of use, but the ornaments are ones collected probably since before I was born. There are lots of new ones too. Oh I love it!!! The tree looks great! What a pretty tree! Do you have any issues with Shiner or any pets getting to the tree? My Charlie likes to nibble on the ornaments so instead of getting a big tree we went with a little one that can fit on our windowsill and she can't reach. Love it! So excited for the holidays! 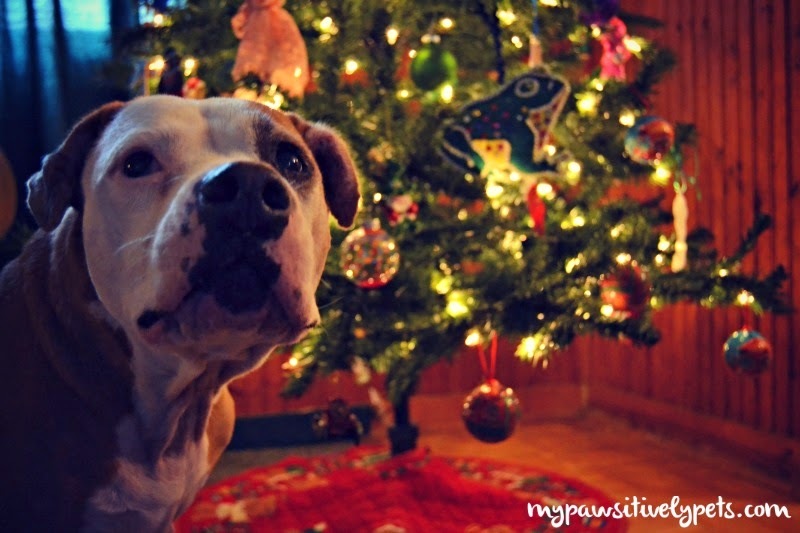 I love seeing Shiner's sweet face against the tree. That would make a lovely Christmas card. What a lovely tree! 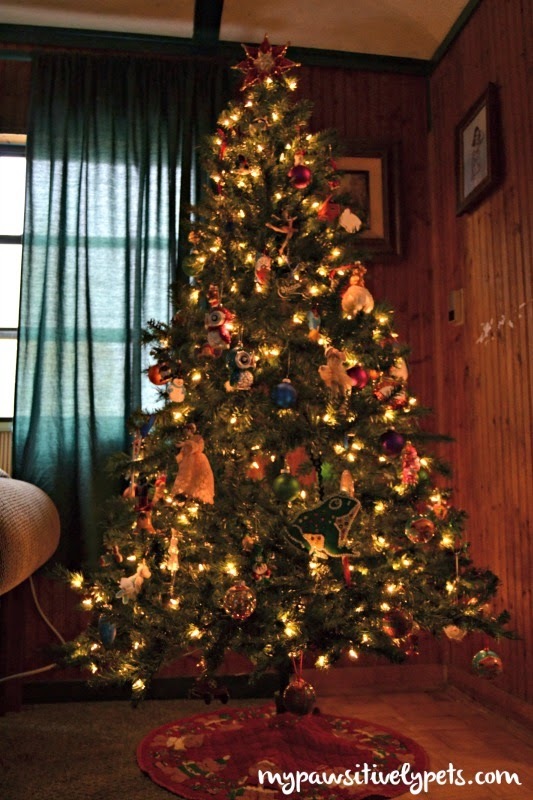 I'm admiring the star too…both of them , Shiner and the one on top of the tree.